Just like their human relatives, new research shows that gorillas also make melodic "yummy" noises when enjoying a meal, New Scientist reports. The new findings, published recently in the journal PLOS ONE, were gathered by German primatologist Eva Luef of the Max Planck Institute for Ornithology and her colleagues Thomas Breuer and Simone Pika. The researchers studied two groups of wild western lowland gorillas in the Republic of Congo and observed the creatures humming and singing while eating their food. Two distinct types of calls were recorded: one that sounds like the gorilla is letting out a sigh of contentment and another that sounds like it's humming a random tune. "They don't sing the same song over and over," Luef told New Scientist. "It seems like they are composing their little food songs." 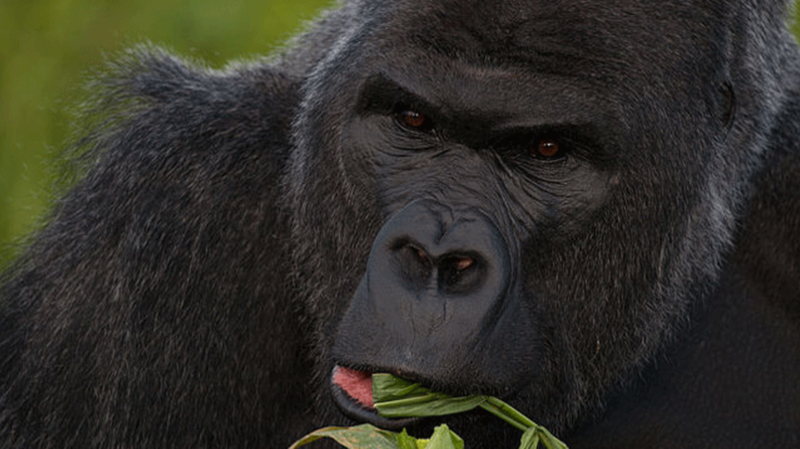 The scientists believe the gorillas vocalize in order to express satisfaction with a meal. Their favorite foods, such as flowers, seeds, and aquatic vegetation, were the most likely to elicit a happy call, while a meal of insects made them considerably less vocal. Adult males were observed doing most of the singing, which researchers said might be due to the fact females and juveniles try not to draw attention to themselves to avoid predation. Chimpanzees and bonobos have also been known to make food-related calls, but this is the first time the behavior has been observed in gorillas outside of captivity. The discovery could now help scientists to better understand how language originated in early humans. You can listen to gorillas as they nom on some delicious banana trees in the video below.